An ear infection is an inflammation of the inner, middle, or outer ear, caused by bacteria or viruses. Ear infections are very common, especially in infants and children. There are three types of ear infection based on the part of the ear involved, each with its own causes, clinical presentation, treatments, and outcomes. Otitis Externa (OE) It is the inflammation of the external ear typically resulting from an infection. It is also known as the “swimmer’s ear”. In its aggressive form, it can affect the soft tissue, cartilage, and bone of the external ear (malignant OE). Acute otitis externa and furuncles are typically caused by bacteria (such as Pseudomonas aeruginosa, or Staphylococcus aureus, or Escherichia coli). Less commonly, it can also be caused by fungi (otomycosis). Malignant OE is caused by Pseudomonas aeruginosa or methicillin-resistant Staphylococcus aureus (MRSA). Factors such as injury to the canal (by cotton swabs or other objects), allergies, skin conditions (such as psoriasis, eczema, seborrheic dermatitis), conditions that decrease ear canal acidity (such as swimming pool water), and irritants (hair spray/dye, etc.) can predispose to OE. Malignant OE occurs mainly in elderly patients with diabetes mellitus or with a weakened immune system. The symptoms include pain, drainage of a foul-smelling discharge, possible hearing loss, tender outer ear (pinna), etc. Fungal OE (otomycosis) is more itchy but less painful and accompanied with the feeling of fullness in the ear. Furuncles cause severe pain and may drain bloody, watery or purulent discharge, with or without reddened swellings (pimples). Malignant OE presents with persistent and severe, deep ear pain, foul-smelling purulent ear discharge, and pink healing tissue or exposed bone can be seen in the ear canal. There may be hearing loss due to obstruction of sound waves passing through the external ear. The diagnosis is based on symptoms described above and includes an otoscopic examination that involves visualization of the ear canal and the external surface of the eardrum. 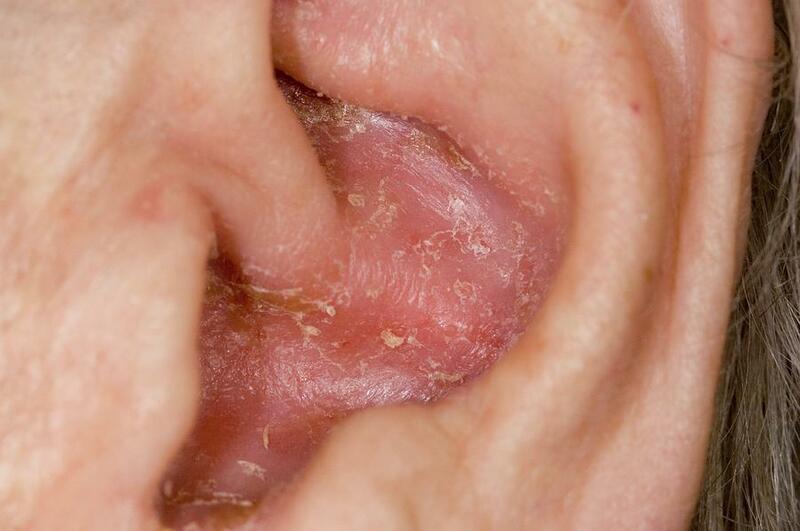 It typically shows that the ear canal appears red, swollen, and there is presence of pus, debris and shedding skin. Otomycosis may show black or yellow dots surrounded by cotton-like fungal hyphae, or a thickened, creamy white pasty material. Malignant OE is diagnosed with a high-resolution CT scan of the temporal bone of the skull, cultures are done, and the ear canal biopsied. The treatment usually involves cleaning of dead tissue, applying topical acetic acid and corticosteroids. In mild-to-moderate acute OE, topical antibiotics and corticosteroids are effective. For moderate OE, an antibacterial solution or suspension. A wick wetted with Burow’s solution may also be applied for deeper access into the external canal, especially when the canal is swollen. It is left in place for 24 to 72 hours. Intravenous antibiotics may be needed for severe OE with skin involvement, along with a painkiller. Fungal OE requires thorough cleaning of the ear canal and application of an antifungal solution unless the eardrum is perforated. Patients are advised to keep the ear dry.